Shitkatapult reissues the first three Apparat albums from 2001 to 2003 as a 3-LP package. Hardly any other musician at the interface between electronic and pop is as greatly cherished and passionately admired as Berlin-based Apparat. He merges the inexhaustible sound worlds of electronic music with the emotional depth of Indie. He makes music to rock out to and to drift away, to sing along to and to dive into. With Moderat, his collaboration with Modeselektor, he has commanded the festival stages over the past several years. He has just completed the soundtrack for the movie “Equals,” and the third Moderat album is in the works. He is also collaborating with theatrical luminary Sebastian Hartmann for the second time. Most people got to know Apparat through his albums “Walls” and “The Devil´s Walk” and don’t know much about his early, quintessentially electronic music dating back to just after the turn of the millennium. In his early twenties at the time, Apparat created an autonomous, radical sound universe on those albums – long since out of print – that even today has just as fascinating an effect on its listeners as it did back then. Shitkatapult is now bringing the three albums together in a beautifully rendered special edition. Produced between 2001 and 2003, the music has been painstakingly remastered by Mike Grinser. Carsten Aermes, a comrade-in-arms from back in the early days in Quedlinburg, designed the cover based on Apparat’s own original graphic design. You have to think back to the time at which this music was made and where Apparat was back then. He is born Sascha Ring in Quedlinburg, former East Germany, in 1979. As a teenager he is swept up in the techno revolution and plays as a DJ in the abandoned hangars of the Soviet army. At 19 he moves to Berlin, where techno is still all the rage. But Sascha already knows that he doesn’t want to listen to club beats all day long and continues to explore the innovative music technology MaxMSP in greater depth. 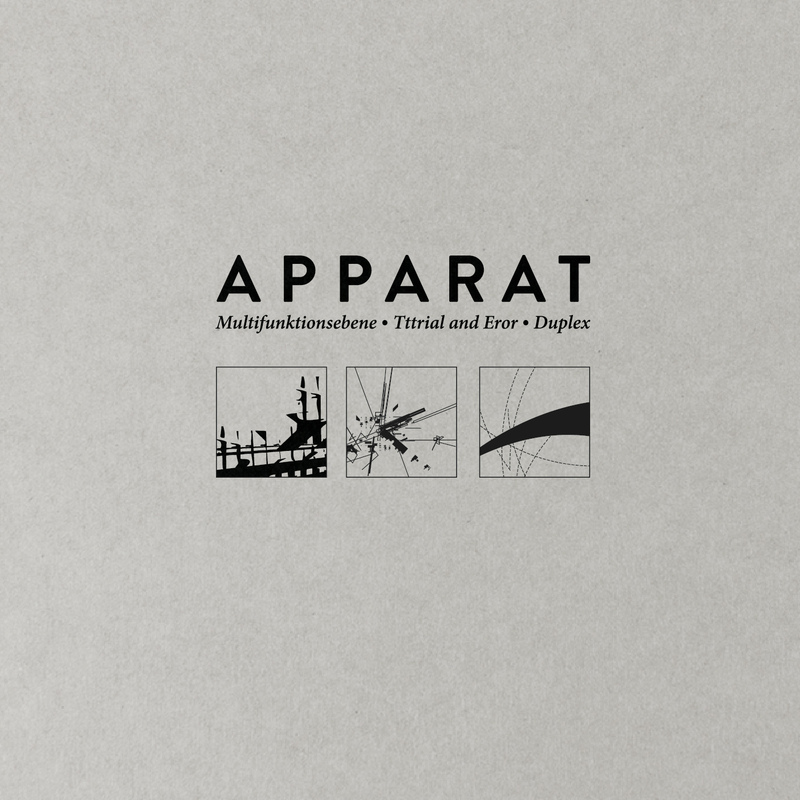 Apparat’s debut album is released in 2001 with the geeky title “Multifunktionsebene.” With its intricate grooves and floating soundscapes, it is conceived from the sound of the time and does its own thing with its differentiated, tuned-down emotional spectrum. It is a recorded moment from another era entirely, which is exactly what makes it so powerful and captivating. “Tttrial and Eror” from 2002 is his electronic opus magnum. Apparat mangles the grooves and develops rhythms with a complexity that makes Aphex Twin seem dull in comparison. And yet from within these tremendous, brutish tracks emerge minute, cautious sounds. On his third album “Duplex” (2003), his world of sound explodes as he adds acoustic instruments to the electronic ones. Throbbing basses create an absurd contrast with saxophones and clarinets. He defines his acoustic space, which is reminiscent of classical chamber music, intimate and tactile. This is where Sascha lays the foundation for Apparat as we know him. The tracks fade softly away and the needle is lifted up carefully from the record. At that age, most guys are only thinking about girls and parties. We can only marvel at the consummate and broad understanding of music that Apparat had already achieved in his youth. The result is relaxed electronica, “de-beautified” by (severe) exceptional sound errors. Most of the time, the results of these random miscalculations are in direct contrast to the harmonic parts of the sound data. Perhaps this will change with the next version of OS. Apparat can also produce and generate audio / visual data as it is equipped with a video interface. This is done most of the time in co-operation with Phon.o - another product of tracnet artcorp. You can check out the results of the complex calculations produced by apparat at www.tracenet.de. And moreover, apparat has computed the parameters for shitkatapult.com 2.0. also available in the www. After only 6 months Sascha Ring is presenting his new mini-lp/cd: Tttrial And Eror. His first release “Multifunktionsebene” (strike20) got great reactions of the press. For one track the Apparat invited the saxophone player hormel eastwood (track 3 ’Pressure’), recorded him and put the sounds in his machines for recalculating. From Schallstrom and Mexican Bier, Berlin based Apparat emerges with a full-length that hits the jackpot minus the bling, partakes in the recent fornication between acoustics and electronics and reaches deep into conveying new and evocative soundscapes. Of course, in Apparat’s mind, it was all planned, and the result is fittingly titled Duplex. The name Apparat means ‘device’ and Sascha Ring aka Device, uh, Apparat loves nothing more than spending the majority of his day twiddling around with any gadget he can get his hands on EXCEPT for those pesky DJ-whoring-tools. Miraculously, in between his twiddling, he finds the time to co-run Shitkatpult and occasionally you’ll find him in a Berlin club enjoying another Shitkatapult tradition - whiskey. This new long player’s screw-music will penetrate deep into your ears and hunt out the pain. Duplex is a collection of new material, poetically absorbing you in every way, steering a symphonic cakewalk blitz through your emotions, and successfully/intentionally bypasses the mundane and empty laptop sounds of the giant sweat-shop of electronic music. It’s full of shock-and-awe, not unlike when you first took that hit of acid and listened to trance-techno (ok, maybe we’re going a little too far but hell, we’re excited about this album). Listen to the songs on headphones after a long day. Listen intently for the recipe a la Duplex: Mexican digi-mosquitoes, droning Catholic organs, heart-wrenching distorted horns, and finally the Device’s renown, shuffled thump beats.